Remember Boris Johnson’s statement about tall buildings? 11 out of 21 proposed towers in London are at risk of being vetoed by the new Mayor, and three supported by local councils could be kicked out after public inquiries amid growing concern that tall buildings are blighting the London skyline. A further seven, including the ‘Walkie-Talkie’ at Fenchurch Street, were given planning permission before Mr Johnson was elected and he can’t overturn this. Mr Johnson has warned he will not approve skyscrapers if residents are opposed to them and today confirmed he will redraw the planned skyline as a matter of priority. In addition, his new planning adviser is Sir Simon Milton, former head of Westminster council who fought off a succession of skyscrapers in central London, including Victoria station. The Mayor has the power to veto any project before it has been given planning permission. So therefore we are all strongly advised to let them know our views! 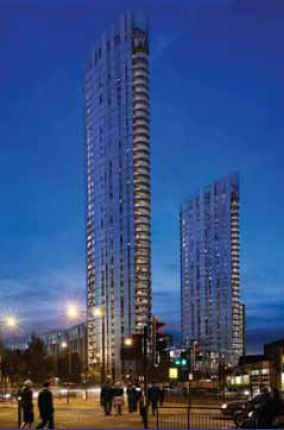 Wandsworth Borough News is publishing each week letters that you sent giving your views and objections on the planning proposal to build two 42 storey towers overlooking the railway at Clapham Junction Station (I will talk about it in a few days). I was contacted 10 days ago by South London Press and gave my views on the project (er, no surprise if you remember this). A shorter version of the article is also available online. There are two points that I would particularly like to comment upon, that I highlighted on the paper’s display. Maybe the developers are showing here their concern for the community, by choosing to ignore the local planning policies. In other words, the developers should be able to build whatever they want, as long as they give some money for the station improvement. As the Councillors of Northcote Ward wanted to clarify recently that the Council was not putting forward the proposal redevelopment, it looks at least that they are showing an interest. In addition I would like to question the second comment from the Council’s spokesman, as saying “the decision would be made solely on planning guidelines“. Does that mean that peoples objections will be ignored? As we focus on the planning proposal for Clapham Junction redevelopment, other applications for skyscrapers (is Wandsworth an attractive place for tower blocks or is it that some people in the council are fond of very tall buildings?) have been put forward in other parts of Wandsworth Borough. Two residential skyscrapers supposed to create a ‘new urban quarter’ and comprising 1,000 apartments as well as 200,000 sq ft of shops, restaurants and offices. Height: Up to 145m (475ft) with 42 storeys and 32 storeys. Location: 16.5-acre site of the Young’s Ram Brewery, Ram Street, SW18. You will find the documentation for the planning application here. And the developers website here. The final decision is due on the 2nd of December. public squares and riverside walk. However I do object in my letter to the Council about the disproportionate size and shape of the two towers, that would much better insert into the area with a reasonable height. As the surrounding buildings in the immediate context of the site are of an approximate maximum height of about 10 storeys (including the new constructions), a proposed development of this height, design and scale would incongruously pierce the skyline, with little relationship between the proposal and the adjoining buildings, and could actually affect negatively the whole borough in the future. In addition, I would like to highlight that, as with other planning proposals for Putney (application rejected by the planning committee on the 6th November) or Clapham Junction, insufficient information has been submitted regarding the impact of the tall building. Insufficient details have been provided of the buildings’ impact on long, intermediate and short distance views and protected viewing corridors (as required in accordance with the CABE/English Heritage jointly produced Guidance on Tall Buildings ). 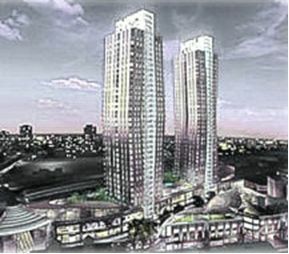 A good example could be learnt for this development from the Victoria Transport Interchange proposal, as plans have been scaled down massively and the developer, Land Securities, was forced to change plans from two 128m towers and a third building of 90m to only one tower of 80 meters and 20 storeys. You might join me and urgently let the Council know your views about this proposal, especially the construction of 2 white tower blocks 150m high (similar to the size proposed at Clapham Junction). I have setup a petition against the planning application for the redevelopment of Clapham Junction station, asking for the refuse of the two 42 storey skyscrapers. Feel free to sign it and tell your friends. Delancey and Land Securities have been commissioned by Network Rail to plan a redevelopment of Clapham Junction Station. The scheme was originally made by three towers (thanks god they reduced it!) sat on a large podium with Clapham Junction bounding the triangular site to the north, Falcon Road to the east and St John’s Hill to the south. The project has been designed by architect firm, ColladoCollins, who have planned the first few floors of the scheme be a huge shopping mall offering 25,000 square metres of retail space. But have you seen any picture of the actual impact of the twin towers around the station? Yes, the leaflet distributed by the Council shows the towers from close up, but they are cut short so you cannot assess the current size. Yes, in fact what the local resident can now see properly is how big and overwhelming the development is. In other words: an eye sore to the area! Have your say and let the Council know your views! Martin Linton has published a letter regarding the development proposal in Clapham Junction. 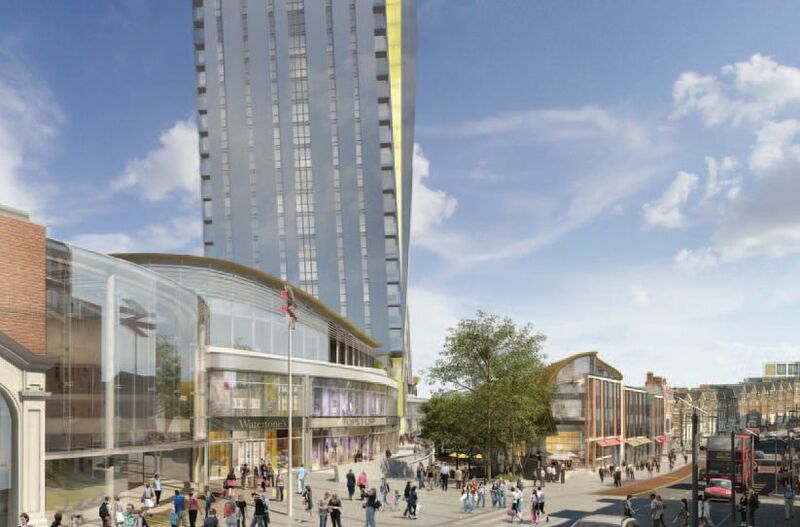 Do you want two 42-storey tower blocks at Clapham Junction station? This is the centrepiece of a proposed redevelopment plan for the station approach which will also include a new shopping area and two new station entrances. 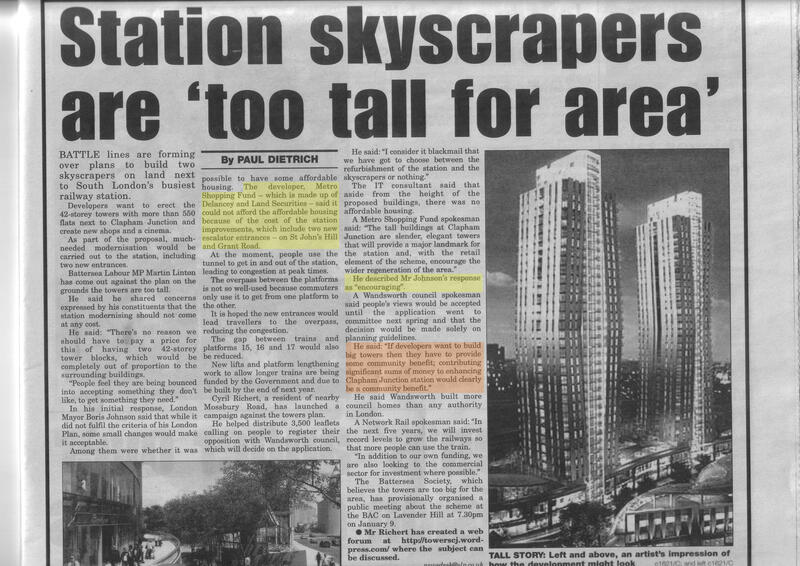 I have consulted local people and the overwhelming majority are against towers of that height. So I am opposing the scheme on grounds of height. They are also against allowing the developers to build 550 luxury flats without any affordable housing. I am opposing it on those grounds as well. I hope you will also submit your view to the Council and send me a copy. Councillors will decide whether to approve the scheme in February. They can give it conditional approval – for instance they can say the height of the tower blocks must be reduced or that half the flats must be affordable. There are benefits in this scheme for station users. The development will allow Network Rail to close the dangerous gap on platforms 15 and 16 and will pay for new station entrances with escalators on St John’s Hill and Grant Road. But improvements to Clapham Junction station don’t mean we have to have two huge tower blocks. They would be among the tallest buildings in London, double the height of council tower blocks on the nearby Winstanley estate and ten times the height of most of the shops in Clapham Junction. I don’t mind if we have clusters of tall building in the City, in Canary Wharf and in Vauxhall, but two isolated towers would be an eyesore in Clapham Junction. I want our part of London to stay on a human scale. I also fear that 556 flats and 239 residential car spaces are going to create even more traffic and overcrowding around what is already Britain’s busiest station. What’s more, the development would cost 250 jobs at the PCS union (who have not yet agreed to sell their building) and 150 jobs at Moss Bros without bringing any significant new jobs into the area. The station definitely needs a major overhaul, but I don’t see why we can’t have improvements to the station and a new shopping area without having to put up with two huge tower blocks. Proposals by Delancey for the Clapham Junction Station Approach site were presented at an exhibition on the site in January 2008. Members of the Battersea Society took part in a discussion about them with the developers’ agents and architects. This response has been produced and agreed by the society’s Planning Sub-Committee to reflect the concerns of members about these proposals. The full document can be found (pdf format) by clicking here. In summary the Society’s response points out that there is an urgent need for an overall vision for Battersea Town Centre, extending to 2020 and beyond. As a minimum this should cover St John’s Road, St John’s Hill, Lavender Hill, Falcon Road and Grant Road. Wandsworth Borough Council, as local planning authority, is responsible for ensuring a masterplan is produced. Decisions about redevelopment of the Station Approach site should be made in the context of this vision and masterplan. A key aim must be to revitalise the shopping centre. The station must be made to function properly as a major transport interchange, not only for people changing trains, but for those changing to and from other modes of transport. That means there must be radical improvements for bus passengers together with the provision of secure cycle parking on a large scale. Any major housing development must include affordable housing, including some family housing. Clapham Junction station is a landmark site, but the proposed towers (shown upper right in an artist’s impression) are excessively high. If you have any comments or questions about this proposal or the Battersea Society’s response, please get in touch with the Battersea Society.